Plain Top Plastic Ice Bags with Twist Ties for quick & easy closure. These crystal clear, wholesale plastic ice bags come with twist ties included for resealing unused ice. 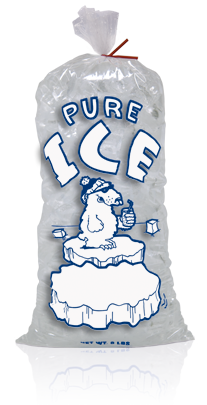 These plastic ice bags are also pre-printed with a Polar Bear or Dog image. 5 lb, 8 lb, 10 lb, 20 lb, and 50 pound drawstring ice bags are in stock and ready to deliver immediately. These open top ice bags can be used with our easy Ice Bagger system to semi automate bagging your own ice. They are made with virgin resins, which are FDA & USDA approved for food contact. EVA has been added to these bags to increase their strength, puncture resistance, all the while reducing brittleness at ice cold temperatures of -20ºF.